The Republic of Haiti has a population of just over 10 million people with roughly 300 dentists serving the entire country. The majority of those dentists practice in and around the capital city of Port-au-Prince and other urban centers, leaving the 48 percent of the population that resides in rural Haiti with limited access to dental care. Because there are no specialty training programs for dentists in Haiti, the entire country has only five clinical specialists. The Faculté d’Odontologie—Haiti’s only dental school—graduates about 15 to 20 students each year. The majority of these graduates leave the country to practice elsewhere after completing their mandatory year of public service. It is the mission of the school’s leadership team to graduate a cohort of dentists who can work independently to serve the Haitian population. They also hope to position the school as a resource for both the people of Haiti and the Haitian dental community. HVO is pleased to announce that we will be collaborating with the Faculté d’Odontologie for an oral health training project, which will support the school in its pursuit of these goals. HVO volunteers will provide clinical and didactic training to Faculté d’Odontologie students. Volunteers will also conduct faculty development seminars for the school’s 52 full and part-time faculty members, and may be asked to conduct professional development seminars open to the wider Port-au-Prince community. In addition, volunteers may assist in restructuring the school’s curriculum. 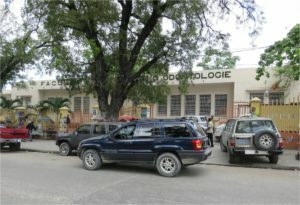 Depending on the timing of their visit, volunteers may also have the opportunity to accompany students and faculty to outside seminars and outreach activities, such as the school’s Saturday clinic, where Port-au-Prince school children can receive treatment without missing school to visit the dentist. For more information on this and other oral health training projects, visit our oral health program page. This project is supported by the ADA Foundation and the American Association of Oral and Maxillofacial Surgeons. Thanks for your message! If you’d like more information about HVO’s oral health project in Haiti, you can contact our office directly at info@hvousa.org. You can also begin the volunteer placement process by completing the volunteer application — just click here.